Want to put a nice and easy to use interface over Lightjams? Here comes the LightjamsPAD, a launchpad app with 160 fully configurable buttons to remotely control Lightjams. Perfect to quickly trigger your effects. Download the	LightjamsPAD (Windows 64-bit). It's free to use with Lightjams! Fully customizable: Each button can have an image and a text to clearly represent its behavior. You can also put a background image on the PAD. Button behaviors: Easily create groups, toggle, push buttons and timers. RGB feedback from Lightjams: Lightjams can send feedback to the PAD and set the RGB color of each button. This way, you can quickly see what's going on. OSC protocol: The communication with Lightjams uses the OSC protocol. This means you can run the PAD on a remote computer. Optimized for multi-touch devices: While it works fine on a desktop computer, the LightjamsPAD really shines when used with a touchscreen. Try it on a Microsoft Surface! Compatible with all computers running the full Windows OS: From Windows 7 and up. Start the LightjamsPAD application on the same computer running Lightjams or another computer on the same network. Go in the OSC settings and configure the OSC input and output to fit your Lightjams OSC settings. Go back in the Button tab and click the buttons to change the texts and images. The LightjamsPAD sends the pressed state of each button to Lightjams. It's either 0% or 100%. Then it's up to Lightjams to decide what to do with this info. Optionally, if you want to create a custom button behavior, you can define it in Lightjams. Here's a Lightjams project file to help you get started: default pads. 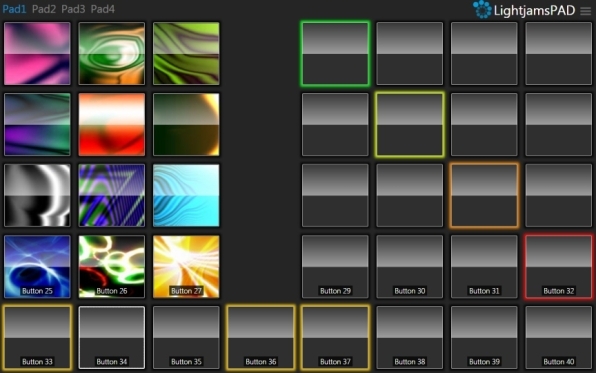 You'll see how to create various types of button, including toggle buttons and exclusive selection buttons. To indicate the state of the show, Lightjams can send OSC back to the LightjamsPAD. The color of each button is controlled via Lightjams like a standard RGB fixture. So you work with the hue, saturation and intensity.